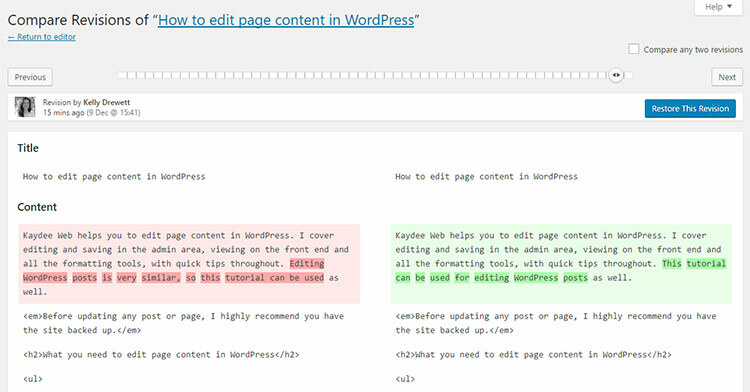 Kaydee Web explains how to edit pages in WordPress. This covers editing and saving in the admin area, viewing the changes on the front end and I also outline the uses of the formatting tools. This tutorial can also be used to edit WordPress posts. Before updating any post or page, I highly recommend you backup the website. Your login username and password from your web developer. The URL of your administration area (also known as web address, or possibly link). Once you have these, navigate to your URL by typing it in your browser or clicking the link. Type in the username and password and hit Log In. You will arrive at the WordPress Dashboard. The first thing I do is I open the front end of the website in a new browser tab. So I have the admin area (back end) visible in one tab, and the public area (front end) visible in the other. Hover over the text link next to the house icon, top left of the screen. I’ve circled it in red on the image below. It is usually the company name. RIGHT CLICK on ‘Visit Site’ on the drop down menu. I have underlined this in red. Click “Open link in new tab”. NB. There may be a variation of words depending on browser. Two tabs are now open. In one, continue to edit in your admin area. The other displays the front end of your website. Navigate to the page you are working on. As you make edits you can tab to the front end to make sure it looks perfect. Each time you view a change in the front end, hit F5 or click refresh on your browser to view it. This prompts the browser to show the new version. Now your working area is arranged, I’d like you to go to the admin area. Click PAGES on the left hand menu. The pages within your site are listed. Further options appear when you hover over the name of a page. EDIT will take you through to the full edit screen. QUICK EDIT will allow you to change title, slug, date, privacy, parent, order, template and status from this screen. BIN will send the page to the rubbish bin. The page will not longer be seen on site. VIEW will let you see this particular page on the front end. To edit a page click the first option, EDIT. Or click on the page name. You will arrive at the WordPress ‘page edit’ screen. What I must first make you aware of is that themes and plugins sometimes customise the ‘page edit’ screen. For example DIVI uses an interface called the DIVI Builder, Avada’s is called Fusion Builder. A custom builder is being used if the edit page screen doesn’t look like the screen shot below. Or something similar. Often themes put icons in different places. Now we’ve established that you are not using a custom builder let’s begin. The first icon is the TOOLBAR TOGGLE icon, once called the ‘kitchen sink’. In the image above you can see it is activated, because it is clicked down. This icon shows or hides extra formatting options. Keep it activated. Like most editors you can highlight text and format it. Quick tip: Double click on one word to fully highlight it. B – makes the text bold, or strong. I – puts the highlighted text in italics. ABC – this will add a strike, through your text as if to cross it out. Handy for sold items. This is the first point. This is the second point of order. At the end of each line, click return (or enter) each time you would like a new line, and a new bullet. Quick tip: clicking SHIFT-ENTER creates a line break, which are useful in bullet lists, as you can drop down one line without creating a new bullet. This is the title of my first point. I say a little bit about this, underneath by hitting SHIFT-ENTER . Now I have my second point. A little bit about this. To discontinue using a list, just hit return twice after your last line. Or hit the icon for a second time. WordPress will return to using normal paragraphs. Your website designer, or theme, may have style the bullet lists using CSS. You’re not always able to change the style directly within the ‘edit page’ screen. This icon is the number list, called ordered list in web speak. It is used in a similar way to the bullet list above. Except that your list will be numbered. Block-quotes indent a text line that you are working on. Again, themes or web developers may have styled these, which you cannot edit directly on page edit. So will indent both sides of a block quote, some only one side. Next up is the horizontal line, which looks like the above once added to the page. The horizontal line is a useful tool for splitting pages, and can be styled by the theme or web designer. The above is the default look, a grey line of 1 pixel. Text alignment is used frequently. However, layout for paragraphs and headings are often set within a style sheet, making these alignment buttons act a bit erratically. What I tend to do is let the style sheet govern my paragraphs, but if I add an image I will align it. Click on one line, then click an alignment tool. Alignment will be applied to a whole paragraph. Quite often, the paragraph below will follow suite when you try to align. This is usually because line breaks have been used instead of ‘paragraph’ tags. There is a simple fix. Put the cursor at the end of the first paragraph, hit DELETE (back space), to pull the second paragraph up. Now hit ENTER to finish one paragraph block and start a new one. These two can now be aligned separately. The link icon is very useful. Both text and images can be linked to pages, posts or an external website. To use it on text, highlight the text first. Quick tip: Double click one word to highlight it all. Hold shift down and click the second word to highlight that too. Now click your link icon. If you are linking to a page/post on your site start typing the title. NB. type the TITLE of the page, not the slug. Once you find the page on the list, hit the blue ‘return’ arrow at the end of the field to apply it. If you would like to customise the link more click the cog icon at the end of the field, before clicking apply. This will open a new box called LINK OPTIONS. Here you can more easily choose the page you would like to link to. Not recommended, but links can open a new window (or tab). Just check “Open link in a new tab” within the link options screen. Google penalises links opening a different window – users must be able to make that decision. To link an image there is a similar process. Select the image, then click the link icon. To EDIT links, follow similar steps. Highlight the text or select the image. Either use the same icon, and change the link to the new one. Or click the pencil icon that appears once the link is selected. This icon complete removes the link. Just click any where on the text link, or select image, then hit this button. The link will be totally removed. This is an icon I never use. WordPress enables you to put text inside a READ MORE tag, hiding it on the page until the user clicks to read more. The text will still be available for search engines to crawl but Google does not appreciate hidden content. Within the toolbar you will see a drop down menu. To format a line, click the text in the line, or paragraph and use the drop down menu to select paragraph, heading 1, heading 2. The styling of each heading or paragraph is likely to be set by your theme, so changing it is not recommended. Just use the right headers in the right places and ask your website designer to change any design elements. Use this icon to underline text in your WordPress content, making it stand out or make a statement. Just highlight the text and click the underline icon. This next icon is also a text alignment icon, and will create a justified paragraph. Text is aligned, flush, along the left margin, and letter/word spacing will be adjusted so that text becomes flush with the right margin as well. Also known as fully justified or full justification. This is good for columns. As a web designer I advise you use this icon carefully. Like any standard text editor, this will change the colour of your text. I’ve seen large, bright colourful words created to stand out on an otherwise well designed site. It doesn’t look good. Try to keep your text uniform. Why have the ‘paste as text’ icon in WordPress at all? You will find that, if you copy text from another website or from Word you also copy the formatting of that text. When you paste it into your page, you paste the formatting also, and your page looks awful. So next time you copy and paste, copy; then put your cursor in the right place and click the ‘paste as text’ tool to add text that has no formatting. Then format it yourself. If you find your text all over the place on a page, it is often the formatting. If you know what you are doing, and you have a back up, use the clear formatting tool to take out all formatting, stripping your text back so that you can now format it yourself. The next icon, the Greek omega opens up the character map below, enabling you to add special characters, such as acute, rave and circumflex. Useful if you are creating a multi-lingual page. These are the indent icons. Using them you can increase or decrease the indentation of a paragraph or heading. And finally the undo / redo icons. The one on the left is undo, and is really useful. It is darker grey in this image, because there is an undo move that I can make. The redo button is disabled, as there is nothing at this time, that can be redone. To redo, you must have undone something first. Every time you make a substantial change to your WordPress content, remember to click the UPDATE button to save the page. This will update the page on the front end of the website. Always refresh your page when viewing changes on the front end. WordPress frequently auto-saves drafts of the page. At the bottom of any page, you can see the time and date of the last “Draft saved” and the last edit, and the author, as per the image below. 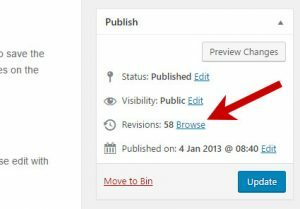 Revisions of your page can be recalled, using the revisions link. It’s on the right hand side, above your UPDATE button. Click the ‘browse’ link to view page drafts and revisions that have been stored over the life of your document. You will arrive at the ‘Compare Revisions’ screen. There is a time line bar at the top of this screen, representing the life of the page. The further left you take the slider, the older the revisions of the page are. WordPress also highlights the changes that have been made, comparing the latest post to a post you choose on the time line. To retrieve your last version the slide should be all the way to the right. Slugs create the URL of the web page in WordPress. If you edit a slug you can break links to the page, so please edit with caution. I recommend using a redirect plugin if you are going to edit slugs. You can easily put the slug back to it’s former glory. A hand tip here, would be to search the page in Google, find what the original URL was, then click into the slug box and change it back. Click OK, then save. Now go back to Google and see if the page is work. small square with a white diagonal on its lower right) and also that screnshots are of very low resolution. would it be possible to help me with those? Do keep up the good work. Hi Harry! Thanks so much for your comment, as it really helps to know if images are missing. I have added them all back in now, sorry it took a bit of time. I will be continuing to improve this post, as you think it is so helpful.